Before we talk about latkes we need to talk about potatoes. I love potatoes. I reaaaaaaally love them. Over the moon love them. Like, I would pay fifteen dollars for a small cup of salt-free french fries kind of love them. So now that we’re clear about this, let me confess something else. Not the good crispy once-in-a-lifetime perfect latkes. But the soggy, grey, what-the-hell-happened latkes that seem to be my fate every Chanukah. And let me tell you this, it’s not that I don’t try. Because what could be more perfect that a patty made from potatoes? Nothing. So yes, I’ve tried. I’ve tried everything — from making them the night before to baking them to frying them in an insanely deep vat of oil — and none of it has worked. Potato Latkes: One Million. Me: Zero. But like all the other challenges I’ve faced, I thought that this might be a good time to makeover the latke. And invite a new root vegetable (parsnips) to the Chanukah party. And this switch up is definitely a good thing. Because most latke recipes are super simple and rely on typically salty toppings (which we’ll get to in a moment) to perk them up. So to make them low-sodium and delicious, these new ingredients come to the rescue. Parsnips provide a natural bite and peppery taste while leeks and carrots lend a sweetness, which mix together to form a veggie cake that is colorful and balanced in flavor. As a bonus, you don’t have to stop with leeks, carrots and parsnips. Grated beets will be even prettier on a plate, not to mention adding a natural “saltiness” due to it’s high sodium content. And for those that cannot eat spuds due to a low-potassium, kidney-friendly diet, use zucchinis and yellow squash to make the latkes. Just be sure to squeeze them out after grating so they are as dry as possible before frying. 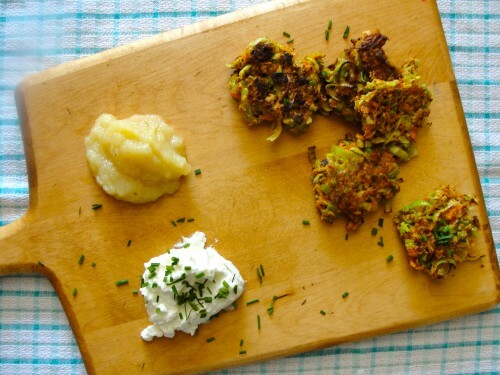 With so many different veggie options, you can try a different latke every night. As for those high-sodium latke accoutrements — like sour cream, smoked fish, and caviar — be sure to get equally creative with your embellishments. And swap out the traditional toppings for low-sodium Greek yogurt or creme fraiche; home-pickled salt-free cabbage or red onions; or a tart cranberry applesauce. 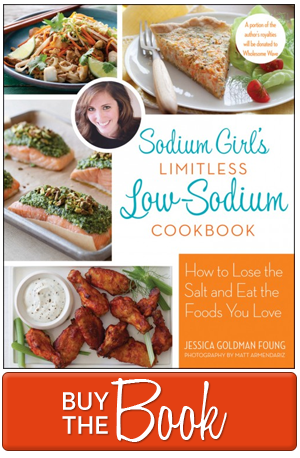 All easy ways to make sure your low-sodium holidays stay flavorful and bright. Cover a plate or cooling rack with paper towels. Then, use a box grater to grate the carrots and the parsnips. In batches, squeeze the carrot and parsnip shreds over the sink until all the liquid is removed. Set them aside in a medium mixing bowl and repeat until all the carrots and parsnips have been squeezed dry. Add the leeks, eggs, flour, dill, garlic powder, and black pepper to the bowl and using a wooden spoon or your hands, mix until everything is well combined. Add extra flour if the batter feels too wet and runny. In a large nonstick skillet, heat 2 tablespoons of oil. When hot and ready, carefully make small patties (about ½ cup each) from the batter and place into the skillet, working in batches to not overcrowd the pan. Fry until golden brown, about 5 minutes per side, and then transfer the latkes to the paper-towel-lined plate or cooling rack. Repeat until all the batter has been latke’d and cooked. 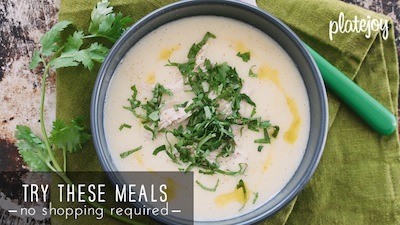 Serve immediately with applesauce and Greek yogurt. 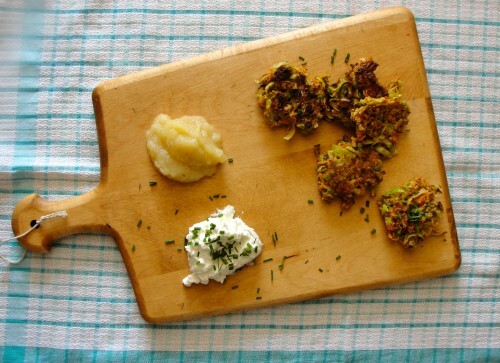 I’ve never made latkes of any type, but these veggie cakes sound awesome! Happy Holidays! I hear ya on the latkes. Always a dismal mess. Will have to try this recipe. And, I also love potatoes! Yummmmmmy. Hi I love latkes…..all kinds I make sweet potato, zucchini, cauliflower and regular, heavenly potato latkes. I love your new ideas. If you are ever in my part of the world, come to me for potato latkes, salt free. Of course! GREAT advice. I actually used grape seed oil this time around and you’re right. Great flavor and great crispiness. I have similar problems with latkes except for this year—I don’t know exactly why or how but they were the best ever. The potatoes had very little liquid in them and I also added baking powder. Also I made them the day before serving them and reheated in the oven-they were crisp and yummy. The other thing I do now is to make them very small so there’s not a whole lot of potatoe to get mushy. Love this recipe and have added to my list of Christmas day appetizers…..as usual, Sodium Girl warms our hearts and our stomachs! Happy Holidays! i’ve always loved latkes! maybe i haven’t know what they were called… but i’ve loved them! In Poland we call them placki ziemniaczane, or placki for short. I adore them. Thanks for the recipe. I noticed that you didn’t mention what kind of oil you used for the frying. Mind filling me in on that? And do you have any tips on how to make latkes form a perfect little ball when frying them? Mine always seem to be falling apart. Let me know what your advice is! I would love to know about your experience exploring food photography: I know you have a team you work with for your book, but do you do most of your own for the site? I am hoping to take it on as my next learning-adventure… any recommendations for cameras/ courses/ reading materials?